Just found it on ebay. The center icon, of course. The Holy Spirit proceeding from the Theotokos? Too bad I won't be bidding on it. Unfortunately I don't understand the joke. Deipara is Latin for Theotokos, last I checked. Whoops! I wrote Deipater at first! "One Bishop to rule them all, One Bishop to find them, One Bishop to bring them all and in the darkness bind them"
It's a word that has been Americaned, I think mostly notably in adjective form deiparous. Marshmallows maybe, but popcorn? Not sure I see it. Not really sure what these are trying to be honestly, but just thought I'd include them here. Mary, Gethsemane, and the Nativity. No. The Kozelshchanskaya is of western origin, and in many ways falls short of canonicity (absence of stars, the exposed hair of the Virgin, etc) but is not schlock. It's in that nebulous group, like Akhtirskaya and Ostrobramskaya, arising from the geographic overlap between RC west and Orthodox east. Folk art at best. Not icons at all. Ghastly and stupid. The disembodied hands (presumably representing the crucified Christ) as a creative variant of Christ Emmanuel are silly enough, but the clincher is the Virgin blessing (only male saints of clerical rank bless), and with her left hand to boot. Attractive Asian Christian art, but utterly unsuitable for Orthodox veneration. There's a thread somewhere where I had quite a bit to say about a picture of Christ and the Mother of God painted as Chinese nobility. A great deal of this sort of stuff comes out of RC circles where "social inclusion" is a major credo. 12And it was told king David, saying, The LORD has blessed the house of Obededom, and all that pertains to him, because of the ark of God. So David went and brought up the ark of God from the house of Obededom into the city of David with gladness. 13And it was so, that when they that bore the ark of the LORD had gone six paces, he sacrificed oxen and fatted calves. 14And David danced before the LORD with all his might; and David was girded with a linen ephod. 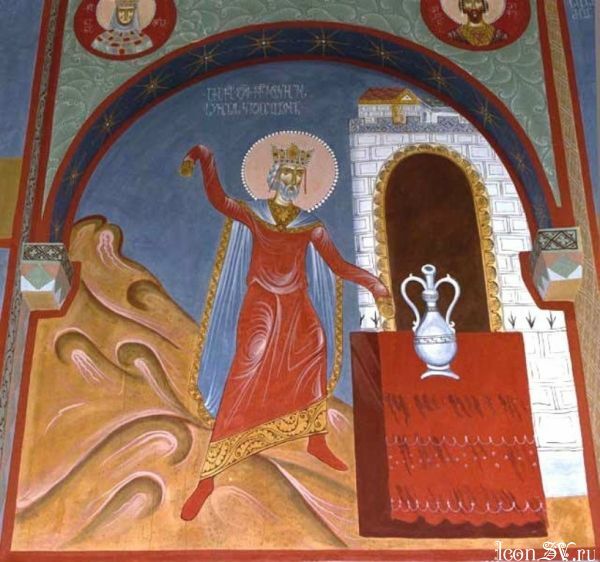 The mural is in a church dedicated to Prophet David the King, in Tblisi, Georgia. This is one of many murals showing scenes from the life of the prophet. But LBK, what is David doing there? It doesn't look like he's sacrificing oxen and fatted calves (unless they're dwarves), dancing in a linen ephod, or even carrying the Ark. My first impression was that he was forcefully throwing a bag of money onto a table. Yeah, but he won't be able to spin on his head while he's wearing the crown. I know. All I can see is him flailing his arms about. The other murals in this church are generally OK in content, but this one just didn't do it for me. And I've never been more surprised that a strange-looking, questionable icon just didn't appeal to our resident iconography expert. Can't have too much bling. A textbook case of over-egging the custard. I think these are fascinating. These are painted by of an artist from Georgia, David Popiashvili - Давид Попиашвили. Date of birth 1969, Tbilisi, Georgia. Graduated from the State Academy of Fine Arts. And? The article you've linked to states clearly that the book where these illustrations feature is a work of "creative fantasy". In other words, a product of the writer's and, therefore, the artist's, imaginations. Further evidence that these pictures cannot be considered to be icons. Folk art, yes, as I wrote before. Cute pictures to illustrate a book, yes. Icons, no. I agree. These pictures are good illustrations, but I would not want them to be icons. 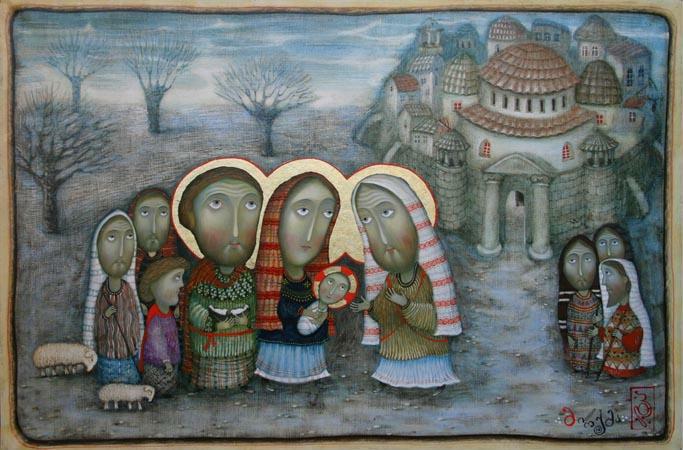 Even though the Georgian iconographic style is different from the Byzantine or Russo-Byzantine standards, these paintings do not conform even to the Georgian style. These might even be didactic and in good taste, but why bring up these illustrations in a discussion about icons? There has to be some kind of pun to be made here about pray vs. prey and abductions. The ET icon really bothers me. Everyone knows his finger glowed yellow/white, not red. Anathema! 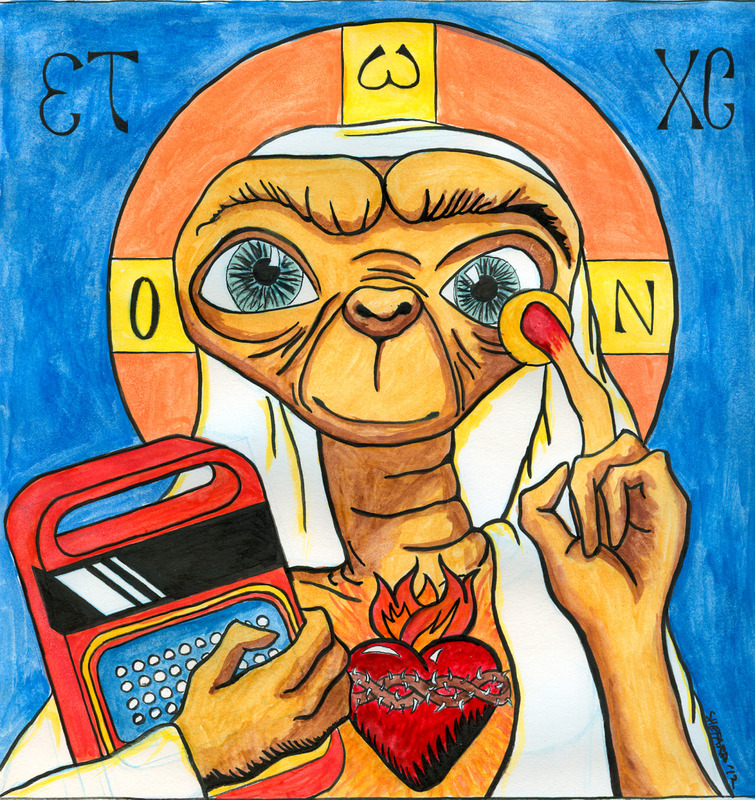 Everyone knows a proper canonical ET icon should NEVER have the Latinized Sacred Heart! This was obviously produced by someone in Rome's Brodo Asogian metropolia. Pfft. If it's good enough for the Antiochian Extra-Terrestrial Rite, it's good enough for me. As for ET's finger glowing yellow-white, look at the "icon" closely: that's a halo around the fingertip. The artist was right all along! I'm no expert but something seems a bit off about this Swedish Coptic icon of St.Erik. That's the problem with the AE-TR; they don't vet the heterodox alien devotions in light of proper Orthodox practice! The Sacred Heart devotion clearly arose well after the schism of stardate 41153.7. "Never, never, never let anyone tell you that, in order to be Orthodox, you must be an Earthling. The Brodo Asogians were fully Orthodox for millenia, and their venerable liturgy is far older than any of their heresies." Ecumenist garbage! Everyone knows that Orthodoxy is the faith that founded the universe, and if the u-word Brodo Asogians — and I would call them much worse than u-words, if the forum rules would allow us to speak of the ETs as they have been historically known — truly wanted to be Orthodox, they would return to it in its most fully preserved form, the EASTERN, EARTHEN TERRESTRIAL form. I would rather be an atheist than worship in a church that allowed reunion with the aliens without them abandoning their disgusting Sacred Heart icons.